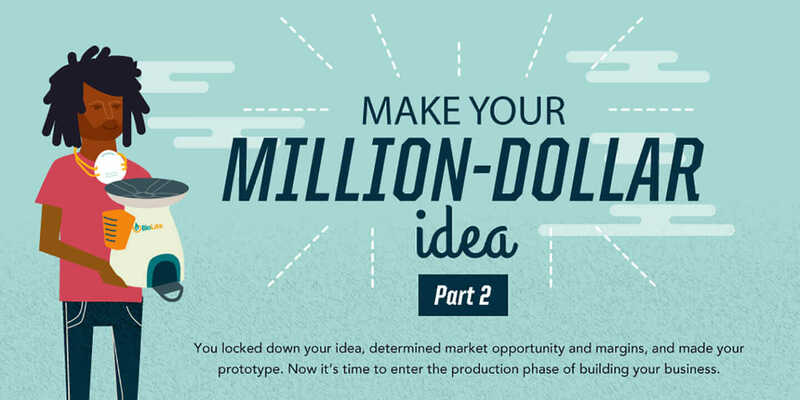 In the first installment of Make Your Million-Dollar Idea—an infographic series to help makers and product designers turn good ideas into businesses—we gave guidance on testing ideas, analyzing competition and market opportunity, determining value proposition, setting margins, creating prototypes, and weighing off-shoring versus new-shoring (local) manufacturing options. If you’re in the initial stages of realizing your idea and creating a business plan, go check out Part 1. Then, join us on this journey to sourcing and manufacturing your designs. There are so many potential pitfalls at every turn of building a product company. If you arm yourself with as much upfront information to see danger before you fall headfirst into it, you’re way ahead of the game. For example, have you thought about all the factors of a manufacturing relationship, whether it’s local or thousands of miles away? Are the materials you need going to be cost effective or even available for production? Who’s doing quality inspections? Have you thought about packaging and how it can be just as important as the product itself? What about all the facets of budget constraints and shipping? All of those details are nothing to sneeze at. Below, Part 2 of Make Your Million-Dollar Idea not only raises those questions and concerns, but it provides useful resources to keep you on the right path to creating your dream business. And stay tuned for Part 3!